Multiple eastbound lanes on I-580 in Oakland were blocked Saturday afternoon due to a fiery Greyhound bus. Roz Plater reports. Multiple eastbound lanes on I-580 in Oakland were blocked Saturday afternoon due to a fiery Greyhound bus. 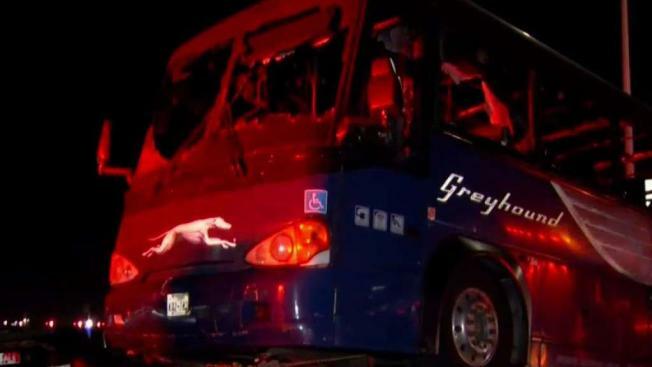 The bus departed from San Francisco and was headed to Los Angeles with seven passengers on board, Greyhound officials said. All passengers and the driver were able to get off the bus and no injuries were reported. "There was smoke combing out of the bus from the rear so the driver pulled over to the right here on 580," said Herman Baza from the CHP. The driver reportedly spotted trouble from his rear view mirror and urged everyone to get off while the fire raged on. When CHP officers arrived, they took the passengers to the nearest Greyhound bus station in Downtown Oakland. "I can imagine," said Baza. "You’re on the bus trying to relax, waiting for a long trip ahead of you and next thing you know your bus is on fire. I can only imagine it’s pretty terrifying." Firefighters battled the flames and were able to knock them down. However, traffic was backed up for miles. A sig alert was issued at 5:47 p.m. as all lanes were blocked but then reopened around 9 p.m.
CHP officials said an engine malfunction might have caused the incident but an investigation is still underway. "I don’t know if they lost anything but thank god they are safe," Oakland resident Jennifer Oswald said.